Once students can make sense of fractions, what are the strategies you use to make sense of their computation? 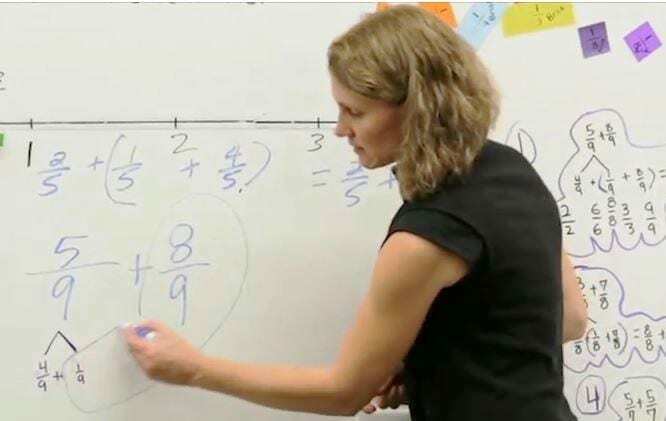 In this clip from Beyond Invert & Multiply, Ms. Kretschmar guides a student-to-student discussion. Students often have difficulty articulating the reasoning behind their approach to solving problems. By asking Muhammad to write down his strategy for decomposing 5/9 in order to add it to 8/9, Ms. Kretschmar validates Muhammad’s method and also helps him become more aware of why his strategy makes sense. Muhammad’s written record of his thinking, and Lorena’s oral explanation, also allows Lupe to understand how decomposing 5/9 into 4/9 + 1/9 made it easy to add to 8/9 and get to the whole.